Thanksgiving is a great time to build in so many academic skills. Here are a few ways I incorporate the holiday excitement into my classroom…because we all know the kids' brains are already moving to break! I love doing this amazing webquest from Scholastic. The site is chock full of great information, and I have my students practice their note-taking skills using a flip book format. The kids learn about what the Mayflower was really like. They get the chance to compare and contrast the lives of the Wampanoags and Pilgrims, and they even learn what the first Thanksgiving was really like. I added an extra tab for them to take notes on interesting facts they find, too. There are so many videos and other great resources on this site that they always need room for extra notes. Here's a picture of my flip book from last year. You can get a free copy of my flip book template (in two different printing formats) by clicking the image below. Right around Thanksgiving, we are supposed to be doing a unit on expository and procedural writing. While my district is moving away from “how-to” writing, I love to use it as a last week before Thanksgiving activity because inevitably there are at least 2-3 kids who are leaving early…like 3 days early…to visit family…or Disney World…or where ever. The whole activity takes about a week, but it is really laid out step-by-step so my kiddos who need to make it up can do a lot of it during their free work time. I find it hilarious to see what the kids determine are the steps to make a turkey. We spend some time talking about the specifics of a procedural text and do a few examples (like having them give me directions to make a peanut butter sandwich…which always goes terribly wrong). Then I give them a prewriting web which turns into a storyboard. I love looking at these. I get kids who want to cook their turkey for 30 minutes at 100 degrees…and others who are going to cook the turkey for 5 hours at 500 degrees. There are even kids washing turkeys in the sink! It is about one of my favorite writing pieces to read. From the prewriting, we move into drafting. I also give the kids an editing and revising checklist to help them make corrections. Once it is all complete, they work on making their own mini-book, which I love to display through the holidays. Here's my example booklet from last year. 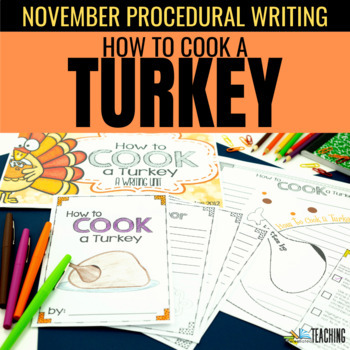 If you want to try it out in your classroom, you can pick up the pack here: Procedural Writing (How-To Cook a Turkey (or by clicking the image below). There you have it! How do you spice up your classroom the last few days before break? Leave me a comment and let me know…I am always looking for great ideas.